The classic account of the Allied invasion of Normandy. 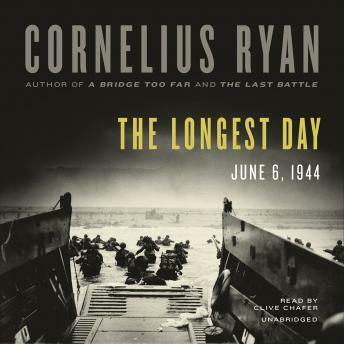 The Longest Day is Cornelius Ryan's unsurpassed account of D-day, a book that endures as a masterpiece of military history. In this compelling tale of courage and heroism, glory and tragedy, Ryan painstakingly re-creates the fateful hours that preceded and followed the massive invasion of Normandy to retell the story of an epic battle that would turn the tide against world fascism and free Europe from the grip of Nazi Germany. This book, first published in 1959, is a must for anyone who loves history, as well as for anyone who wants to better understand how free nations prevailed at a time when darkness enshrouded the earth. Narrator really makes this book hard to listen to. Monotone and resembles a meditation like voice. I believe they tried to find a voice of someone of the time instead of a good narrator. I probably won't finish this book because of it.